Found a link on the bad news website that features the t-shirts Markus may have been on about earlier. Says shipping due Oct, five colours! For a black one! It appears the biggest size is L though! Graham can you get us some? Top find Mark! Nobody bothered to tell me. Scroll down to the bottom of page http://www.badnews.co.jp/main/en/public ... cgi?id=808 to see all five colours! Sounds like L should do for us non-Japanese, unless your Mark's size that is . They are gathering orders first before printing, deadline for ordering is Friday 16th September (remember Japan are 8 hours in front of UK and almost one full day ahead of Hawaii). Shipping starts in October, as Mark mentioned. Needless to say, they are limited edition. I will try to get in touch with them if they'll do XL for the 808 website, but to be on the safe side I would say secure a shirt through the Japanese site for the time being. Just woken up after being out all-night for an acid all-nighter featuring Gerald, Baby Ford and Luke Vibert to see this mail! Ordered one of each t-shirt, and btw, "mail address" is your e-mail address! Prices are 3500 Yen a shirt which is about 20 Pounds, 30 Euros and 35 Dollars. It's unclear at this stage if there is any shipping charge and if so, how much it is (600 Yen?). I hope to have more information next week. Have added the news to the news page. Hoi you cheeky monkey, A Large should do me, but I like a more roomy fit!!! I shall order via the site to be safe! Well, if it will fit me, then it should fit anyone! Just ordered Nick. I hope it fits me, if not Markus will have to get me a XL specially made! I've actually lost a little weight so I should manage to get it on may be a little snug around the old love handles tho! 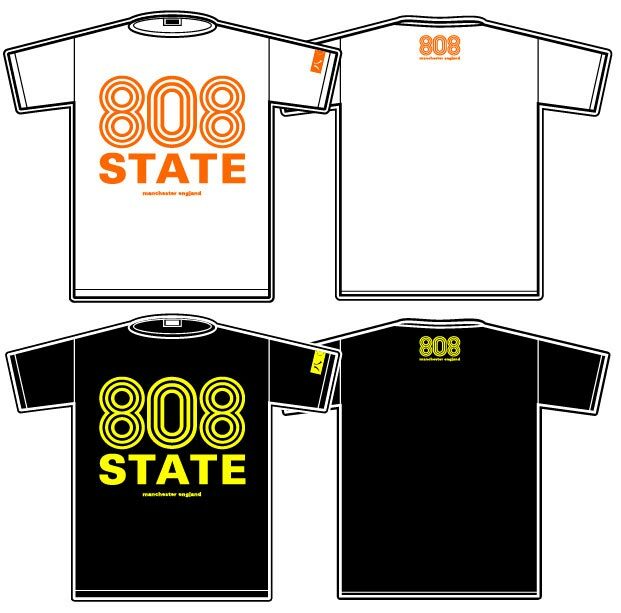 Shirts read 808 STATE manchester england on front and 808 manchester england on back. There is something written on the sleeve too, but can't see what it says. Have now found out that shipping isn't free, it's 600 yen. I'm not sure what happens if you order multiple shirts, trying to find out. Last edited by markus on 12 Sep 2005 20:04, edited 1 time in total. Paid for mine the other day and they've already authorised a payment of just over £20 for the shirt, so that must include shipping. I think it says Wire05 on the sleeve. What colours are you all getting, we don't wanna clash.......HA! .............or is it 808 in Japanese, I can't tell.